The first time I was in Sydney Australia my son was too young to climb the harbor bridge and on subsequent trips to Australia there wasn’t enough time in Sydney. So when we had the opportunity this year we jumped at the chance and made it to the top on the Ultimate Sydney Bridge climb. A fantastic experience and memory that will last forever! For those a bit fearful of heights (and that would include me) I’ll begin by saying the safety procedures were truly impressive. In fact the first 45 minutes or so of your “climb” will be associated with preparation and safety including a breathalyzer test for alcohol which may not be consumed before a bridge climb. Assuming one is sober, the next step is to gear up! Everything is provided from a fashionable gray and blue jumpsuit, snazzy wrist band with attached handkerchief, a lanyard for sunglasses and waist belt with metal carabiner to attach one’s body to the bridge. Absolutely nothing loose is allowed which means no purses, backpacks or cameras on the bridge and all personal items must be secured in a locker. Even hairclips can be a problem and several ladies in our group were given hair bands in their place. This suiting up is done with great efficiency and humor as cheeky young Aussies explain how each safety procedure was developed to overcome objections raised by conservative (and undoubtedly older) legislators before the bridge climb became a reality. A process that apparently took years. When preparations are complete, each group of 10-14 is led out through a stone passageway onto the bridge struts and the climb begins in earnest! There are hundreds of metal steps and several vertical ladders to ascend/descend so participants must be in reasonable physical condition, but kids as young as 10 are allowed and our group included seniors, so pretty much anyone physically fit can do it. Another factor to consider is the weather because the Sydney Bridge Climb takes place 365 days a year whether the day is cold, hot, windy or rainy and it’s a very popular activity so many people plan ahead. 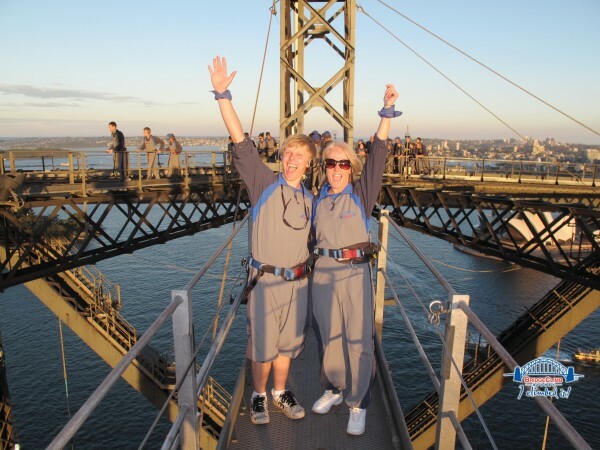 The Ultimate Sydney Bridge Climb takes about 3 ½ hours in total and includes prep time, stops for photos (available for sale as no cameras are allowed… ) and changing back into civilian clothes. The cost starts around $180 per person with premium rates for twilight and night climbs. Kids and groups are discounted. We were fortunate and had moderate temperatures, clear blue skies and sunshine for our climb and we enjoyed eye popping views of the entire city, the Opera House and Sydney Harbor from the top. All in all it was a thrill to climb the bridge and stand 440 feet above it all. I’d do it again in a heartbeat and suggest you include this and other unique adventures in your Australia plans! Please call or email linda@totemtravel.com for assistance planning a vacation in Australia. I can help with independent travel, escorted tours to Australia, cruises and activities. See you Down Under! Travel with $2-300 in cash, an ATM card and two major credit cards. Call the customer service number on the back of each card before you leave to advise that you’ll be out of the country. The bank will note your travel dates and destinations and this will forestall a security hold for “unusual activity”. You should also verify your daily limit for ATM transactions and check on any credit/debit card fees for international purchases. ATM machines are located in all major airports, near major tourist attractions and throughout the cities and towns just as there are here. Plus most hotels, restaurants and stores accept major credit cards. The ATM is normally the least expensive and most convenient way to get cash and the only trick is to convert your daily limit in U.S. dollars to the local currency then take out that amount. That way you get the bank rate of exchange with the lowest possible fee. The worst place to get cash is a currency exchange counter! They either charge astronomical fees or have a terrible exchange rate and they are masters at advertising only one aspect of the transaction… We also do not recommend travelers check unless you don’t have credit/debit cards. Travelers checks are not widely accepted and they are a hassle to use. One more suggestion – if you are buying something expensive (e.g. jewelry, original art) use a credit card and make sure your receipt states specifics for the purchase. Fraud is not a common problem but if your emeralds turn out to be green glass most credit cards have fraud protection and will reverse the charge if challenged and documented. If you have other questions about international travel or need assistance planning your next trip call the experts at Totem Travel. We have travel agents that specialize in the most popular destinations. A few weeks ago I was in Australia on vacation and had the opportunity to stay at the incredible new Southern Ocean Lodge. What a fabulous place to vacation or honeymoon! After a hard day spotting koalas, kangaroos and echidnas I returned each evening to gourmet meals and every luxury imaginable. My “ordinary” suite at the Southern Ocean Lodge had wall to wall windows with unbelievable views, heated floors, a rain shower, champagne and dark chocolate in the minibar, down pillows, mood lighting and more… Upgraded suites add soaking tubs, a fireplace, private bedrooms and private Jacuzzis. It has been said before, but the attention to detail is unbelievable! Upon arrival each guest is given a personalized itinerary for their stay which typically includes guided walks, sightseeing about Kangaroo Island and special evening gatherings. Everything from meals to drinks to sightseeing is included in the room rate. I’m a Seattle gal and coffee snob, so in the morning my latte was “created” with a heart shape in the foam and served overlooking the pounding surf of the spectacular Southern Ocean. My breakfast choices included home baked breads and pastries, lovely tropical fruits, some unusual chef specials, all the traditional items and more of the amazing view. During the day I was off to see the sights but in the evening I returned to the lodge to mingle with other guests. Before dinner, a favorite gathering spot is the bar where gourmet appetizers are served and guests mix their own drink from a full selection of liquors and appertifs. Wine connoiseurs wander into the elaborately stocked cellar to choose their favorite bottle or simply ask for a particular selection. Dinner at the Southern Ocean Lodge is a leisurely affair with 4 or 5 gourmet courses and after dinner you can enjoy brandy or coffee with your shoes off in front of the fire. At the Southern Ocean Lodge everything is top of the line, everything is included, but the atmosphere is decidedly casual. Picture spending the weekend with your billionaire buddy and you’ll start to get the picture! With all this luxury it was hard to leave the lodge, but Kangaroo Island itself is amazing and my tour company, Exceptional Kangaroo Island, was just voted “Best Australia Experience” by travel agents specializing in Australia. As a returning guest I can tell you why… this is small group touring at its absolute best! The guest to guide ratio is never more than 6/1 and you travel in luxury 4 wheel drive vehicles with an outstanding and knowledgeabe guide. Morning and afternoon teas includes lots of homemade goodies and every guest is treated to a sumptuous BBQ lunch with freshly caught seafood, local cheese and honey, a secret salad dressing and great Australian wines. Every itinerary can be customized but most guests will want see the Remarkable Rocks, endangered seals, Admirals Arch and take a bush walk to spot kangaroos in the wild. I recommend at least 2 nights on Kangaroo Island to see it all and, if the budget permits, pamper yourself at the luxurious Southern Ocean Lodge. This is the perfect spot to get away, celebrate a special anniversary or honeymoon in Australia! Take a look at the slide show, browse our Australia vacation ideas, then email or call Linda at (800) 321-7907 when you’re ready to see Kangaroo Island. As an Australia Specialist, I promise this will be a memorable and special part of your Australia experience! As a travel agent specializing in Australia and the South Pacific I readily admit I’m spoiled. My job requires me to travel (over & over again) to a destination many only dream about. Then when I head Down Under, I’m treated to some of the best vacation experiences Australia has to offer. My trip following the 2008 Australia Specialist Conference was no exception. My itinerary included two World Heritage listed areas – Fraser Island and Lamington National Park; my arrangements were made by Down Under Answers voted “best Australia wholesaler”; I was pampered at the luxurious new Southern Ocean Lodge; toured with Exceptional Kangaroo Island voted “best Australia experience”; and ended my trip sampling award winning wines. I’ll write more about Queensland, Adelaide and Kangaroo Island plus my accommodations at Kingfisher Bay Resort, O’Reillys, Southern Ocean Lodge and the Adelaide Heritage Apartments in separate posts. But right now I wanted to share my sneak peak of the upcoming movie “Australia”. Baz Luhrmann directs and the movie stars Nicole Kidman and Hugh Jackman, both very easy on the eyes and ears… The preview I saw reminded me of “Gone With the Wind” or “Out of Africa” with stunning scenery, romance, adventure, war and everything it takes to make an Academy Award winning movie. I’m looking forward to the mid November release and hope you’ll catch the movie and the spirit of Australia. In the Seattle area Totem Travel and Down Under Answers will cohost a movie premier night so maybe you’ll join us! Our theme is “Australia: If you like the movie, you’ll love the country”. For more information on Australia travel please call Linda, Totem Travel’s Australia Specialist at (800) 321-7907 or email Linda@TotemTravel.com. I’m back from Australia but off to Fiji soon… did I mention I’m spoiled? Where can you rub noses with a Maori tribesman, enjoy spectacular scenery from an alpine train, cruise through scenes from Lord of the Rings, bungee jump from a bridge (or a tower) and hike on a glacier? Why New Zealand of course! Add to that bubbling geysers, world class sailing, four wheel drive excursions, hot air ballooning, kayaking in Abel Tasman and The Milford Trek and you’ll have an idea of some of the adventures available in this part of the world. But it’s not just adventure travelers that are happy in New Zealand. You’ll also find luxury lodges with glorious views, miles of pristine beach, wineries, open countryside with more sheep than people, charming villages and modern cities. Accommodations are equally diverse with everything from camper vans to farmhouse stays and simple motels to elegant lodges and hotels. Plus you can explore by car, train, helicopter, boat or bus and be free as the wind or TLC’d by a guide… There is truly something for everyone in New Zealand! On one recent trip, we spent most of our vacation time on the South Island starting in Christchurch with a visit to the Antarctic Center and punting on the Avon River. The next day was the TranzAlpine train through the Canterbury Plains and over spectacular Arthurs Pass and the mountains known as the Southern Alps. This is a train trip everyone should include in their itinerary. In Greymouth, we picked up a car and made the scenic drive to Franz Josef where we spent the night. In the morning, after discussions of strenuous climbs and leaps over crevasses, we chose to hike the slighlty less daunting Fox Glacier. This proved just the right challenge for our mixed age group. No specialized gear was required and climbing boots were provided along with a personable and knowledgeble guide. There were a few tricky spots but overall it was a great experience and the views at the top, with pictures to commemorate the accomplishment, were well worthwhile! The next day’s drive took us along the coastline and over the mountains to Wanaka, which is a lovely little town. We would have enjoyed a day to simply relax, but we had a date with a Queen… or Queenstown that is… The highlight of our New Zealand vacation! Queenstown is surrounded by dramatic mountains and sits on the shores of beautiful Lake Wakatipu. The town itself is charming with lots of shops and open air restaurants, a Kiwi Museum, bicycle and walking paths around the lake and a gondola ride to the top of the mountain. There you can visit the museum, snap some gorgeous pictures or be a bit more adventurous and literally jump off the edge of the mountain top in a tandem paraglider! Those that prefer to remain earthbound can head for the luge track, with wheeled cars for fair weather fun, or the view restaurant where you can sip and sup. Near Queenstown you’ll find many other adventures including a 4 wheel drive excursion into Skippers Canyon where early New Zealanders mined for gold, the Dart River Safari which takes you up river into spectacular Lord of the Rings scenery, a working sheep station at the far end of the lake, and for thrill seekers, bungee jumping and the shotover jet. Yet another “must do” near Queenstown is Milford Sound with its dramatic fjords and waterfalls. A day excursion by bus or plane is easily arranged or you can consider a night on the lake or in Te Anau for a more leisurely experience. Depending on vacation time and budget, you can complete your South Island vacation with a side trip to Dunedin, known as the most Scottiish city outside of Scotland or a stop near Mt Cook and Lake Tekapo before heading on to the North Island of New Zealand or, sadly, home. More to see another day! As an Australia Specialist I’ve had the opportunity to explore many parts of the land Down Under, but with a country the size of the U.S. there is always more to see! My personal travels in Australia have included Sydney, Melbourne, the Great Ocean Road, Adelaide, Kangaroo Island, Heron Island, the Whitsundays and of course Cairns and the Great Barrier Reef. In addition to sightseeing “musts” like the Opera House and Bridge I’ve had numerous once in a lifetime experiences such as watching a sea turtle lay her eggs on Christmas Eve (it’s summer in Australia), sleeping next to a full size bright red fire engine in Adelaide, taking a bush walk in unspoiled countryside abounding with kangaroos, wallabies and koalas, scuba diving amongst giant clams and exotic sea creatures and a delightful stay in the Daintree Rain Forest at Silky Oaks. This country has something for everyone! You can enjoy Australia year round but the “best time” depends on where you go and what you wish to do. The temperatures are tropical all year near Cairns but our winter (December – February) is the rainy season and brings troublesome jelly fish to the beautiful beaches. 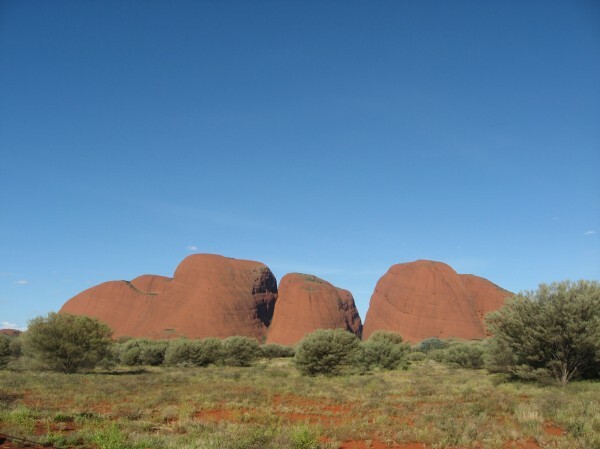 A trip to the Outback, Ayers Rock, Darwin and the Northern Territories is best April – October to avoid scorching temperatures and Tasmania is best October – April to avoid the snow! Depending on your style and budget, you can explore the country independently, schedule a few day tours or join an organized tour group with guide. Just as in the U.S.A., special events & unique accommodations require reservations and holiday travel should be planned several months in advance. Given the distances involved, most visitors should take advantage of various Aussie passes to hop around by airplane and pretty much anyone will benefit by planning their trip with an Aussie specialist such as myself. There is simply too much to see and too much to do to see it all on one vacation, even if you have 2-3 months to travel! With all the traveling I’ve been privileged to do, Australia and New Zealand are two of my favorite destinations in the world and I hope you’ll visit soon. Please call when you’re ready to begin planning and until then, G’Day!